This is a guest post by Mika Kane, a ukulele enthusiast and professional player. Kane is currently studying music at the University of Hawai’i at Manoa and is a member of the Kamaka Team. For more info, visit Mika’s website, and follow his YouTube and Facebook channels. When you’re a kid, adults tend to ask, “what do you want to be when you grow up?” Back then I didn’t know the answer. As I grew older, I was exposed to new and different things. I remember back in elementary school, we would play ‘ukulele once a week for 45 minutes. At the time, I wasn’t interested in playing. My dad tried to get me to play ‘ukulele as a hobby shortly after, but I still wasn’t interested. It wasn’t until 7th grade that my friends would bring their ‘ukulele’s on the bus ride home and start jamming songs. It was November, and my friends were taking the ‘ukulele class at school and started learning Christmas songs for the upcoming Christmas concert. I strongly remember them playing Carol the Bells. For some reason, I was absolutely fascinated when I observed them playing. I just had to learn how to play! My friends taught me the chords so that I could play in the background while they play the melody. The rest is history. Little did I know that the ‘ukulele would forever become a major part my life. Although I was in a band class playing alto sax, my friends taught me all the songs they were learning in their ‘ukulele classes. Every day at school, everyone would see me carrying my ‘ukulele, playing it at every chance. All this excitement and curiosity led me to do some independent research. I took it upon myself to self-teach myself to play more complicated songs. At the time, Jake Shimabukuro was the man to look up to for ‘ukulele playing, and I remember watching my first video of him playing “Dragon” on YouTube. It would be the first song of his I would go on to teach myself in 8th grade. I didn’t stop there; I was dedicated to learning all the Jake songs I could! I figured the more songs I play, the more techniques I would learn. Thus, being able to play more genres of music while increasing my musical repertoire. At this time, adults would still ask me “Mika, what do you want to be when you grow up?” I would respond, “I don’t know”, but really, I wanted ‘ukulele to be a big part of my future. I was too ashamed to say that I wanted to become a famous ‘ukulele player because that just sounds silly and unrealistic. 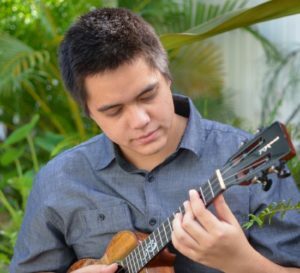 Slowly as I continued my journey throughout the 8th grade and on to High School, I would go on to entering many ‘ukulele contests, as well as having opportunities to playing in public. Each experience gave me more confidence and a clearer vision that maybe playing ‘ukulele professionally may in-fact be possible. During my senior year in high school, I made a huge decision. I decided that I wanted to attend college to study music. I would go on to attend the University of Hawai’i at Manoa on the island of O’ahu. Little did I know that this would be one of the best decisions of my life. When I got into the music program at my school, they didn’t have an ‘ukulele program, so I got placed into classical guitar as my primary instrument. At first, I was very disappointed and nervous because I never really played guitar throughout my life, and now I’m about to declare myself a classical guitar major in the music department. However, this would be a blessing in disguise. Taking a step back from the ‘ukulele, I was completely engulfed in the music program. I was studying classical guitar, music theory, aural training, music history, counterpoint, form and analysis, and well, the list goes on and on. This has completely changed the way I thought, played, and approached the ‘ukulele. During this time, I also met Dr. Byron Yasui, the ‘ukulele professor at the Music Department. 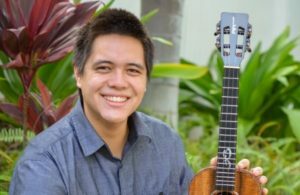 Dr. Yasui has endless amounts of accomplishments, but most recently, he was the mastermind behind the first ever ‘Ukulele Concerto, Campanella that was premiered on June 6, 2015, featuring Jake Shimabukuro. Although he taught a beginning ‘ukulele class, I ended up taking it because why not! This would be yet another blessing in disguise. Although I have heard of Dr. Yasui as a jazz ‘ukulele artist, when I saw him play for me some jazz ‘ukulele, I immediately knew that this is what I wanted to do: the style, the genre, the harmonies, everything about it. I would go on to become his private student learning his secrets, the importance of music theory integrated with the ‘ukulele, and more importantly, being the one to carry his torch. His vision for me was to become a teacher and teach the next generation of ‘ukulele players the importance of musical theory. Although I never thought about becoming a teacher, this has opened my eyes to the possibility of having a career of teaching and playing the ‘ukulele.